Let's get bike lanes on the Danforth. Danforth can have it all: protected bike lanes, on-street parking, and four travel lanes, with little impact on motor vehicle traffic capacity. We're calling for bike lanes on this well-used corridor. Sign the pledge so that our elected officials know we're already riding, and it's time for the infrastructure to catch up to the numbers. Kudos to Ward 14 Bikes (former Ward 30) Toronto-Danforth ward advocacy group for their bike count showing bikes at 21% mode share during the p.m. peak - in line with Bloor bike count numbers immediately prior to bike lane installation. The Danny is indeed ready for protected bike lanes! Join or renew your membership to help support impactful campaigns like Danforth Loves Bikes! Already a member? Consider making a donation to this campaign to bolster our advocacy efforts. Sign up for Action Alerts to find out how you can support bike lanes on the Danforth. 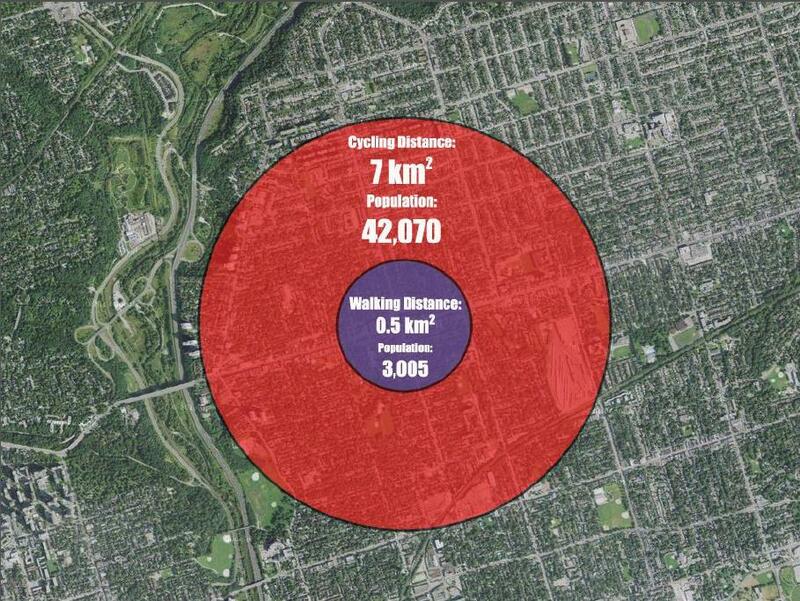 There is a significant gap in Toronto’s cycling network east of the Don Valley. The Bloor Viaduct helps connect east end cycling commuters out of the core via the protected bike lanes on Sherbourne St. However, the lanes end at Broadview Ave. There are several north-south bike routes east of Broadview Ave but no high quality infrastructure options to connect them. All of the other bridges crossing the Don (Gerrard, Dundas and Queen) have streetcar tracks which make continuous routes challenging, if not impossible. In July 2018, Cycle Toronto joined David Suzuki Foundation and Friends & Families for Safe Streets in speaking to the excellent Danforth Planning Study report presented to Toronto & East York Community Council on July 5. We were pleased to see the Community Council pass motions (subject to full Council approval at its July 23-25 meeting) supporting a Complete Streets Study for the Danforth in 2019 which will lay the groundwork for the installation of protected bike lanes. In order to get bike lanes on the Danforth requires a Major Corridor Study. In June 2016, City Council voted unanimously to reinstate a Danforth Avenue Major Corridor Study (as included in the new 10 Year Cycling Network Plan). A majority of people arrive by walking, cycling or transit. A 2014 study by Ryerson University students and the Toronto Centre for Active Transportation found that more than 80% of patrons arrived to Greektown by walking, cycling or transit (Playter Blvd to Carlaw Ave). Cyclists spend more money. Portland State University researchers found that customers who arrive by bike spend 24% more per month than those who arrive by car. Protected bike lanes increase retail sales. New York City found that protected bike lanes had a significant positive impact on the strength of local business. After the construction of a protected bike lane on 9th Avenue, local businesses saw a 49 percent increase in retail sales. In comparison, local businesses throughout Manhattan only saw a 3 percent increase in retail sales. Torontonians want to ride more often. Over 70% of Torontonians would cycle more if infrastructure were improved. People are already biking in large numbers on the Danforth. Adding protected lanes would allow drivers and cyclists to co-exist in their own safe, predictable space. If you build it, they will come. Study after study demonstrates that after protected bike lanes are installed on main streets, cycling volumes increase significantly. Cycling volumes nearly tripled on Adelaide after protected bike lanes were installed - and motor vehicle volume flows as before. Do you run a business on Danforth Ave and want to show your support for bike lanes on Danforth? Email info@cycleto.ca to request a sticker! This map shows businesses along Danforth Ave that support adding Danforth to the new bike plan and launching a pilot project as soon as possible! Drop by, shop and thank them for their support! Enhancing cycling on Danforth is good for local business! Above Pape & Danforth: 3,005 people are within a 5 minute walking distance of Pape & Danforth. Over 42,000 people are within a 5 minute bicycle trip to Pape & Danforth. This project was made possible in part through funding from the Heart and Stroke Foundation.